Hearthstone's villains have united for Rise of Shadows and Shacknews continues breaks down each card leading up to its April release. Today, how would you like your brew? Taunt: When you draw this, restore 4 Health to your hero. Analysis: Any chance the Warlock gets to reliably restore health is a luxury they'll happily take. And fortunately, Aranasi Broodmother can offer that up. First, let's look at the downsides. More often than not, your opponent will knock exactly when you draw this card, since its effect kicks in immediately. That'll give them a chance to plan accordingly. But that's a downside worth enduring if you can make this pay off more than once. That's entirely possible, thanks to the new Plot Twist spell. 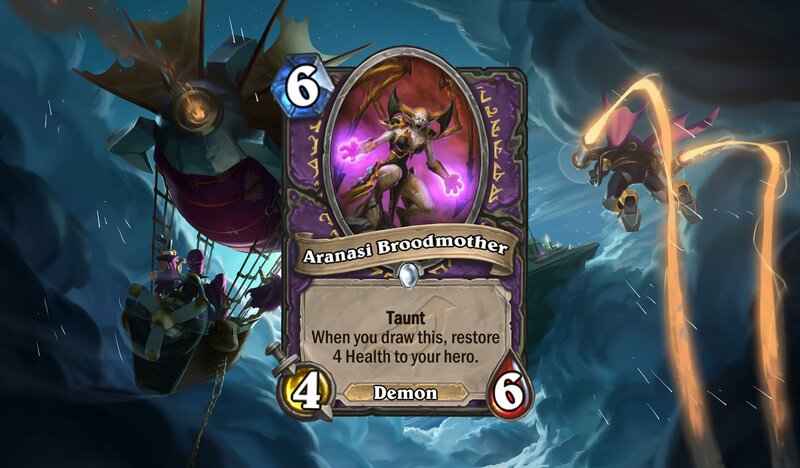 That means Aranasi Broodmother can be shuffled back in to be drawn again later for some extra health. Outside of the health boost, this is a vanilla 4/6 Taunt, which can be tough to remove, but not something you'll want to build a deck around. Of course, if you can buff it up with your multitude of the Warlock's handbuffing effects, it could be made into something a little greater in the late game. Analysis: The first thing to note is that this is a very expensive play at 10 mana. For that much cost, this had better be worth its while. That leads to the second thing that should be noted about this card. It doesn't summon two different minions. It summons two copies of the same minion. 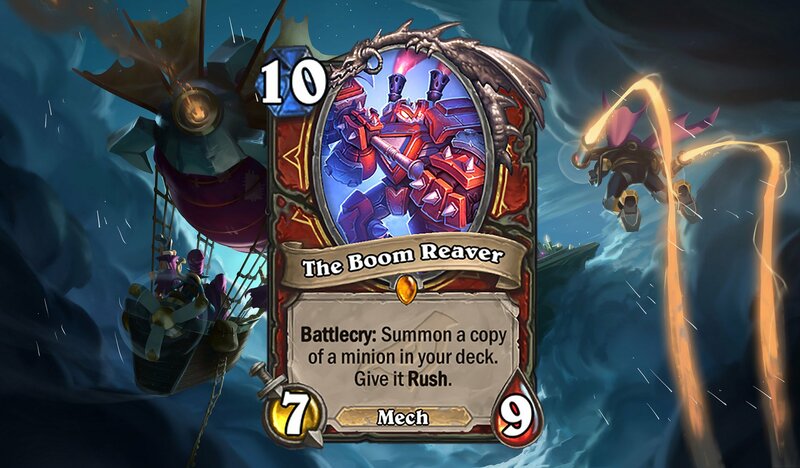 That means there's room to get two big Legendaries on board on top of the original Legendary still in the Warrior's deck. Now if you're going to blow 10 mana on this, it needs to be on something that's worth spending it on. Alliestrasza's video shows this card pulling out Akali, the Rhino, which is a fine pull for that card's effect. The same could be said if it pulls out Oondasta. But finding an effective minion for Dimensional Ripper doesn't get easier after that. The reason for that is that Dimensional Ripper's cost doesn't allow for any follow-up plays. You need to make sure this play pulls the right minion and there's no guaranteeing that it will. You're just as likely to pull out two copies of a 1-Cost minion, which becomes a total waste. 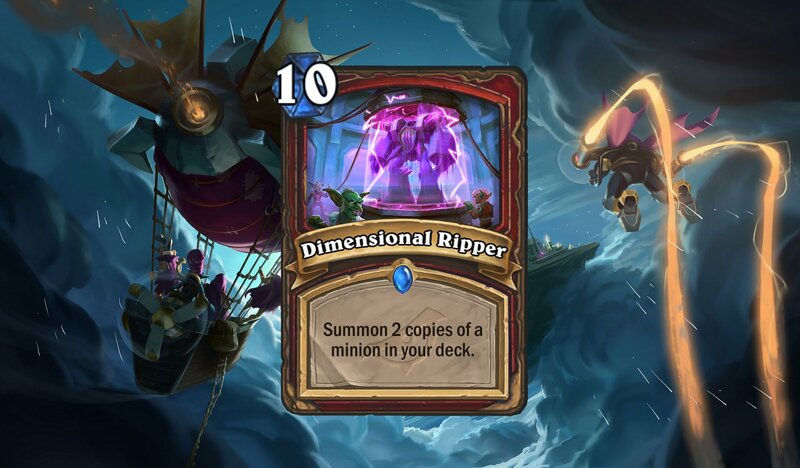 If you're playing a big body Warrior deck, this can work, but until that meta comes to exist, Dimensional Ripper doesn't really work right now. Analysis: It should be noted that the Hunter is losing a lot of its valuable opening plays in the Standard change. Both Jeweled Macaw and Dire Mole are rotating out, which is going to leave a void for most Hunter players. The opening turn Springpaw will still be there amd that's definitely not a bad Turn 1 play. 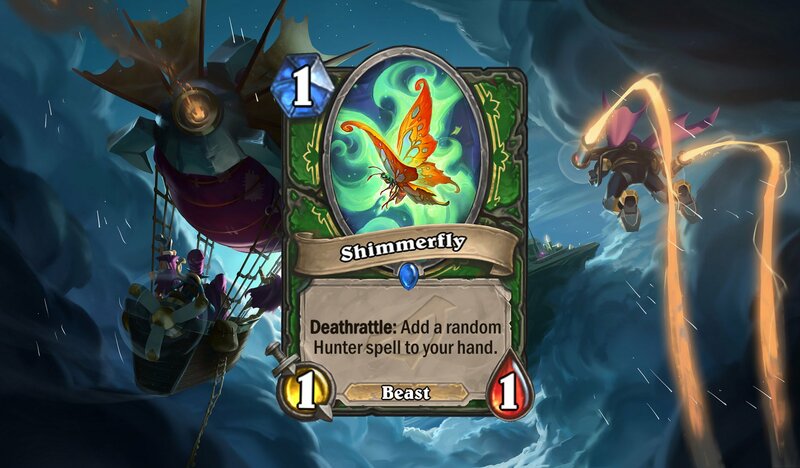 But the Shimmerfly might arguably offer some better value, with the Deathrattle effect possibly offering a nice Turn 2 Secret. Expect to see Shimmerfly quite a bit in Standard Hunter decks for a long time. Analysis: The Arena player is going to miss the Grim Necromancer. Having a 2/4 body along with a couple of 1/1s was really handy. Fortunately, it looks like there's something to fill the void in the new Standard year. The Hench-Clan Hag maintains the motif of the Grim Necromancer, but on top of a 3/3 body, its 1/1s are Amalgams. Yes, the Amalgam is a minion that has tribe synergy with everything. It's the Amazo of Hearthstone. That means there are a handful of tribal cards that'll work with them, including Zilliax on Turn 5. The Amalgams will also have Demon synergy, so look for the Hench-Clan Hag to potentially find a home in a Zoo Warlock deck. Analysis: Whoa! Archivist Elysiana may not fit into a lot of specific decks, but it's going to be hard to argue against this effect. It essentially staves off fatigue for up to ten extra turns by replacing your deck with ten new cards. That applies to your deck if it's totally empty, too. There are a lot of good uses for Elysiana. If you or the opponent decide to run Hakkar, the Soulflayer, Elysiana will essentially destroy all of the Corrupted Bloods in your deck. The same principle will apply if a Warrior opponent tries to fill your deck with bombs. Arena players will often see their games go to fatigue, but if they manage to draft Elysiana, they'll not only save themselves from that fate, but they'll more often than not get the tools they need to see themselves through to victory. Elysiana is a big thumbs up, one of the better Legendaries of this new set. Analysis: Let's go from a good Legendary to potentially the Legendary of this set. 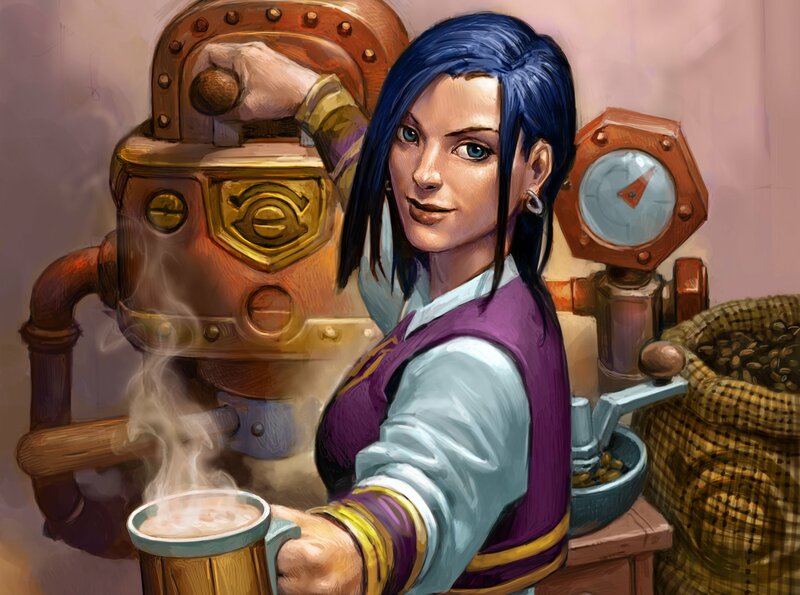 Yes, the Dalaran barista might be the strongest Legendary of this expansion. 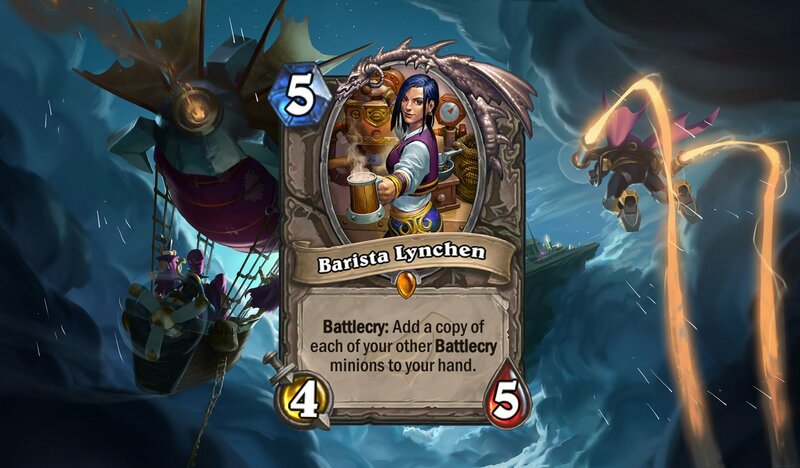 Barista Lynchen will put copies of every Battlecry on your side of the board in your hand. And that's going to be a much more effective play than it looks, given the wealth of Battlecry minions out there in both Standard and Wild. Even if she only copies early-game Battlecry minions, that's still a lot of value for a Turn 5 play. If she can copy something like Krag'wa, the Frog or Jan'alai, the Dragonhawk, it's gravy. The value that Barista Lynchen can offer cannot be overstated. If your deck packs a lot of Battlecries, there's no reason not to include her in your deck. Wild Mages, in particular, may want to try her out in an Elemental deck and make some copies of Leyline Manipulator and Zola the Gorgon to get yourself discounted minions and spells. Analysis: Here's something nice for the Arena player. Exotic Mountseller is a big 5/8 body that can help fill your board with some decent Beast minions. And 3-Cost Beasts are certainly nothing to sneeze at. While you're likely to pull out something like Ironbeak Owl, there are some good high roll possibilities out there. Ornery Tortoise without the drawback is a strong pull, as is something like Augmented Elekk and King Mukla. The Exotic Mountseller will work beautifully in the late game, as Arena resources start to run low. Even without spells to support it, the 5/8 vanilla body should stand up to most attacks. It may not be the same as Dimensional Ripper, but it does carry a lot of its disadvantages. Unless you're only carrying big bodies in your deck, you're just as likely to pull out something that won't make the 10-mana play worthwhile. If you can ensure it pulls out Oondasta or the like, it's a good play, but otherwise, it's far too risky to reliably put into any deck. Twinspell: Destroy a minion. Summon 2 minions of the same Cost to replace it. Analysis: Who's ready for shenanigans? 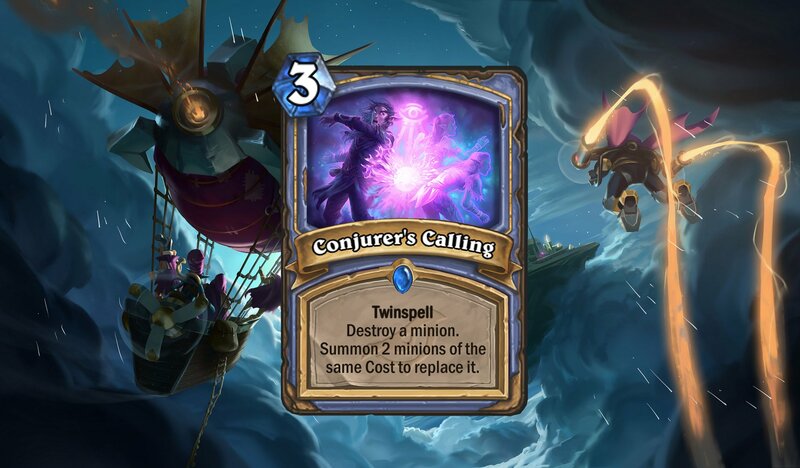 That's what Conjurer's Calling promises, largely because the idea is to sacrifice a minion and replace it with two different minions of the same cost. For the Mage, this could mean sacrificing minions on the verge of death or triggering a beneficial Deathrattle early. Wild Mages will want to pack this in either with different Eggs or with something like Sylvanas Windrunner. For Standard Mages, this is a nice insurance policy to offset some bad RNG. If you get a random minion off an effect and it's no good, simply use Conjurer's Calling and re-roll. For double the fun, try combining this spell with Khadgar to get four minions for your trouble! That's it for the community cards! All that's left is the Lightning Round, which is coming on Monday, to wrap all of these analyses up. Hearthstone: Rise of Shadows is set to release this Tuesday, April 9.